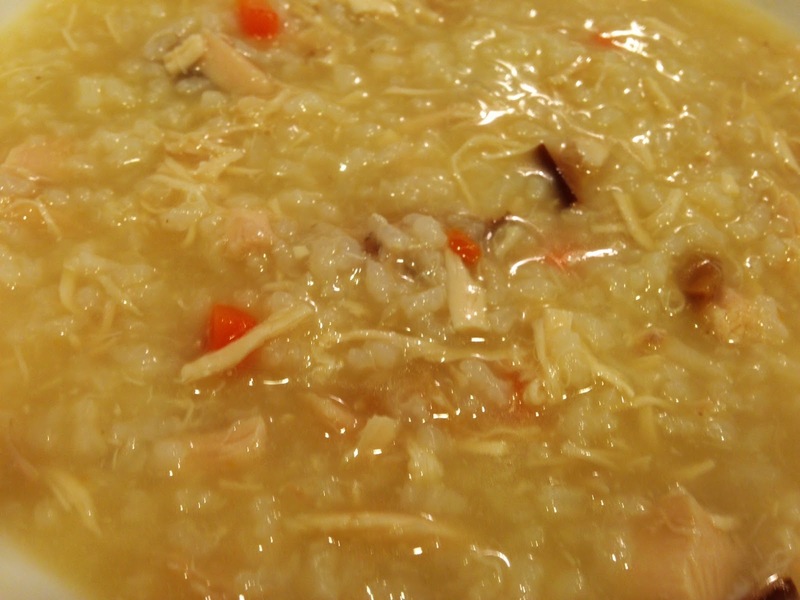 Chinese Jook (rice porridge) is a dish often served after Thanksgiving, when there is leftover turkey and turkey bones. The savory ginger and garlic in the jook is aromatic, and gives this dish just enough flavor on a cold night, or comfort food when you are sick. You don't have to wait until you have turkey on hand to make jook. You can use leftover chicken and carcass anytime. I've found the chicken from Costco or Sam's Club is easy, and has a lot of seasoning, that you don't have to add more salt or flavorings to the jook. 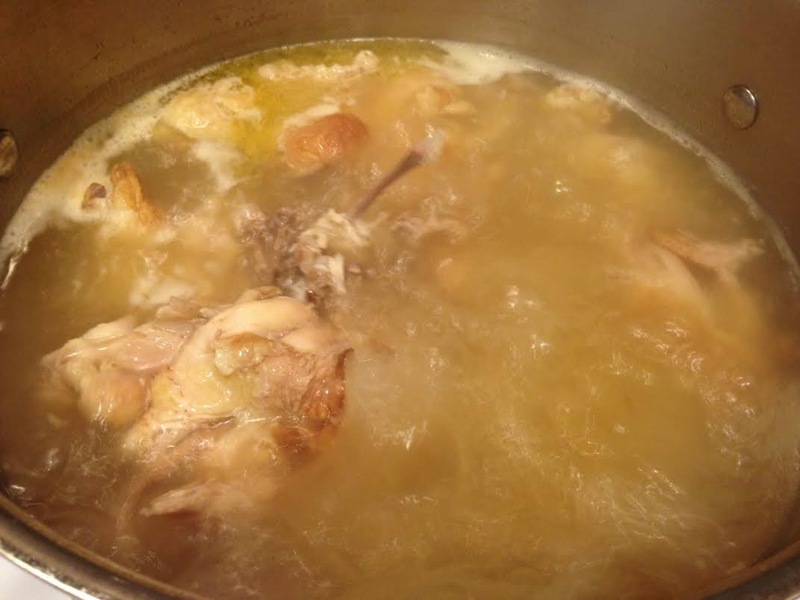 Fill a pot with water and boil the entire chicken (cut in sections) until the chicken begins to separate from the bones. Add 2 1/2" of smashed fresh ginger and two cloves of smashed garlic to the pot. Skim the fat and scum from the top. 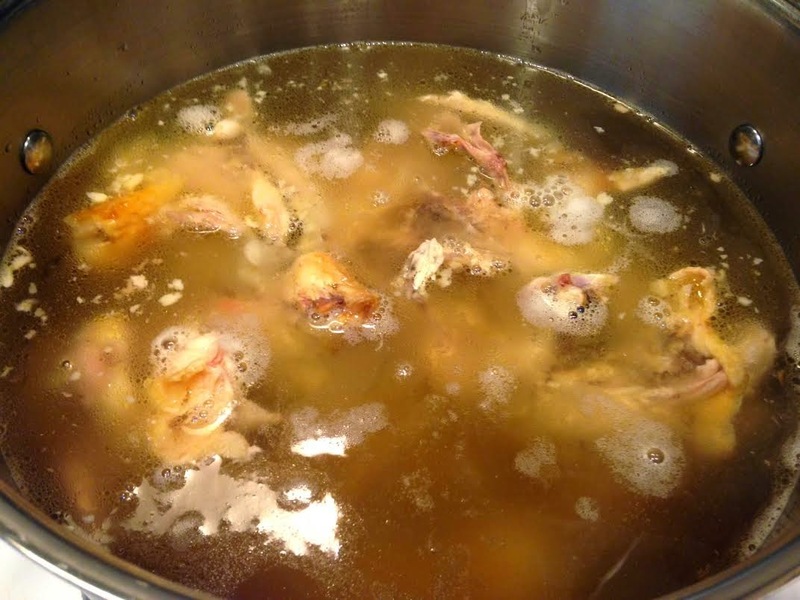 Remove chicken and bones from the pot. Skim the fat again. Reduce heat to simmer. Shred/chop the chicken into small pieces and reserve on the side. Add vegetables (I like to use shiitake mushrooms and carrots) cut into small pieces. Put into pot and ﻿bring to a boil until the vegetables are tender. Add chicken back to pot. Add uncooked, washed, rice to the pot (use 1 cup rice to 8 cups water for best results) and boil until rice is cooked. This is approximately 20-25 minutes. Add chicken broth to pot until you have the right, thick porridge consistency. Serve hot and enjoy. Make a double recipe as this freezes well.